When people get to talking about who the island’s most popular entertainer might be, one name keeps getting overlooked in all the chatter about The Rankins, Ashley MacIsaac, Rita MacNeil, J.P. Cormier, Natalie MacMaster, the Barra MacNeils, Bruce Guthro and the like. And that’s probably because Duncan Wells’ loyal fan base is more concerned with the practical considerations of everyday life - like learning how to tie their shoes or getting the hand of riding a new bicycle, for instance - than arguing the merits of their favorite performer. But, over the past ten years the Sydney singer songwriter has made an indelible impression on wave after wave of young Cape Bretoners with a pair of strong independent albums, a book/tape project and lively shows in schools and community halls all over the island. Wells’ latest full-length CD, The Love & Safety Club , a project conceived for the Cape Breton Fire Fighter’s Burn Care Society and the Atlantic Burn Camp, is yet another well-crafted series of thoughtful children’s songs that will effectively entertain the younger set without talking down to them - an all-too-common failing of more than one nationally-known children’s performer, I’m afraid. Musically, this album takes a simpler instrumental approach than the previous two, which, I suspect is not entirely an accident. Wells has been at this game for quite sometime and has perhaps come to the conclusion that the best way to capture the sometimes wandering attention spans of the younger generation is to have catchy lyrics that stick in their minds after one or two listens, backed by toe-tapping beats. As an overall concept, I also like the way Wells has had some fun with the theme of the album - childhood safety - by coming up with a wide variety of sounds and rhythms for what otherwise could have easily become a by-the-numbers list of safety concerns. Take the rollicking Kayakin, which cleverly slips in some timely safety tips while taking the listener on an exciting kayak trip down a river. It’s no stretch to imagine kids everywhere humming the bouncy “kay-yi-yakin” chorus under their breaths as they put on their safety helmets before heading out for a bike ride or buckle their seat belts in the back seat of the family car. Whoa Nellie is another gem, with clever and original lyrics about being careful when you run around the house. As the song progresses, they lyrics speed up faster and faster with each repetition of the chorus until, like the character Nellie herself, it’s careening along at a barely-in-control break-neck pace. The Bullies On The School Ground takes a no-nonsense look at a probelm parents have been trying to solve (without much success, I might add) for generations. Instead of putting a dark spin on a dark topic, Wells takes the hopeful high road and gives the song a light and bouncy treatment that effectively sugar-coats the few simple and sensible solutions he proposes. Ignore bullies, ask them to stop bullying or even try to make them your friends are all sensible ways to deal with the situation at the schooyard level. The lively Irish tune, Michael’s Rhyme, is one of the more perceptive songs on the album. Based on the life of Corner Brook native, Michael Gaultois, a burn survivor who has done a great deal to help burn vicitms in Atlantic Canada make the most of their lives, the song is both a warning to children to be careful around flammable substances and celebration of a burn victim’s successful struggle to face the world once again. Every Duncan Wells album has one song that’s just a cut above the others and Shine, is the centerpiece of this particular album. This beautiful lullabye is packed with crystal-clear everyday images that are found only on the finest songs written for childhood. Fine background singing from the Miracle Sisters - a chorus of young singers who have seemingly grown up singing background on Wells’ best songs - give added depth to a composition that ranks with his best work. 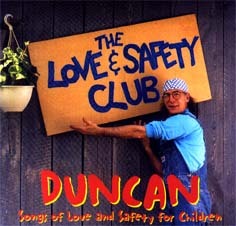 The Love & Safety Club benefits a great deal from this “keep it simple” attitude and is arguably his best recorded work to date.